Grace & Elegance in a Private Enclave | This absolutely gorgeous home in the hills above Lake Sammamish combines elements of the Craftsman aesthetic with the classic architecture of the shingle style to craft a gracious and inviting manor house for contemporary times. Fine materials and careful design mesh with meticulous construction and a park-like setting to create a residence that is at once stately and historic in feel, yet open, airy and light-filled for modern living, with surfaces and details that convey warmth, solidity and enduring elegance. This is the ultimate expression of the builder’s art, set on a large, open lot with its own sport court, numerous patios and a fire pit, as well as a charming guest house, all surrounded by mature forest. This estate-scaled property offers the best of both worlds – a private and expansive natural setting that enjoys easy access to all of the recreational, business and entertainment opportunities for which the region has become justly known. Sited on over an acre of gently sloped land, this singular residence backs up to native forest for a palpable sense of privacy and tranquility. The outdoor space this location provides is used to great effect, with large areas of open lawn that invite relaxation and play from people of all generations, as well as charming resting spaces that include a fire pit for evening marshmallow roasts and a grand tree house in the woods. A large fenced sport court can support everything from tennis to basketball, while the spacious patio off the back of the house affords plenty of room for outdoor dining and entertaining with a built-in cooking area and stone retaining wall. Mature landscaping and specimen plants define a number of outdoor seating and regarding areas, while a charming guest cottage provides additional space for work or play. The property is approached via a wide, paved drive that passes in front of the main house for a gracious and convenient entry, then curves around to garages and parking on the side to keep the primary façade free of vehicles and utility spaces. An assortment of native plantings greets visitors on the way to a wide and welcoming entry porch that wraps around the house, affording plenty of sheltered, outdoor space. Arts & Crafts architecture is referenced in its multi-gabled roofline, large-scale windows, columned entry porch and material selection of shingles, board and batten and stone siding. With an exterior palette of subtle greys, contrasted by crisp white trim, the overall effect is one of timeless elegance and grace that complements its beautiful surroundings. Entry to the home is through a pair of oversized, leaded glass doors that open into a grand two-story foyer, with inset marble floors, wainscoting and meticulously detailed trim and casework that carries through the rest of the house. The main level floor plan is open and flowing in its layout, allowing formal spaces to blend easily with each other in a circular pattern for unfettered access and great transfer of natural light. This is a sunny and refreshing home, with tall ceilings, wide hallways and passages with extra-tall doors to ensure an unsurpassed sense of volume and ease in every space. The foyer opens into a formal living room to the right that then leads directly through to the dining room. A butler’s pantry connects this more formal area of the house to the gourmet kitchen, which also includes a spacious casual dining area that can easily be expanded for large groups, while a series of stately columns help define a grand family room toward the back of the house. To the left of the foyer, resides a spacious private home office that is separated from the public areas of the house by a pair of glass French doors. A formal central staircase and a secondary stair between the family room and garage connect the two levels of the house, and provide easy flow. Finally, a powder room and fully outfitted laundry and utility area round out the first floor, just behind the office. The finishes employed in this house are of exceptional quality, with wide plank cherry hardwoods blending seamlessly through both floors, and an unusually high level of detail in all moldings and trim. Designer fixtures and hardware compliment highly figured solid hardwood in cabinets and built-ins, and many of the rooms feature vaulted or tray ceilings, with wainscoting prevalent on the main floor. Natural stone surfaces can be found in the baths and kitchen, with wrought iron and burnished hickory used as accents throughout the house. A richly neutral palette of warm greys and beiges unifies the home, while crisp white trim provides a pop of brightness and contrast. This is the perfect backdrop for a wide array of decorating styles, and an environment that is as richly luxurious as it is enveloping and comforting in all seasons. 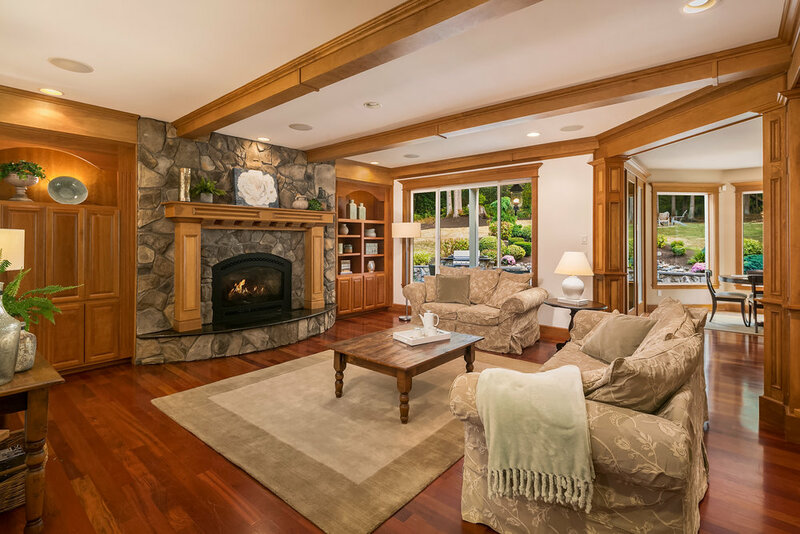 The formal living room is a dramatic space, washed in light from three planes of double hung windows with transoms, and situated under a high, vaulted ceiling for a tremendous sense of volume and air. Wainscoting wraps the room, blending with a grand mantel over the fireplace that serves as the anchor to the space, while deep cherry floors contrast beautifully with its pearl grey walls. A columned passage connects the living room to the formal dining room, a wonderful place for family dinners and entertaining. It, too, features an extra-tall, vaulted ceiling with soffit lighting and wainscoting, as well as a wall of built-ins for serving and storage. The room is lit by a hand-made wrought iron chandelier, and leads to the kitchen through a butler’s pantry with wine storage, integrated beverage cooling and a separate storage pantry. Just down the entry hall to the left, is a private and autonomous home office. It includes a wall of custom built-ins for storage and display, two double hung windows that look out on a private garden with its own water feature, and a tray ceiling with crown molding finished in natural hickory to match its casework and window trim. The room is easily closed off from the rest of the house by a set of paned glass French doors. The rear of the house functions as the epicenter of the home, offering a gorgeous gourmet kitchen, a huge family room and plenty of space for casual gatherings, as well as French door access to the patio and backyard. Ample recessed lighting provides great illumination for a variety of uses, while exceptionally crafted natural woodwork lends the area an air of European grandeur in the form of beamed ceilings, highly detailed columns and custom cabinetry. A stone fireplace in the family room anchors the whole space with a warm hearth and honest materials. The kitchen is a gourmet’s delight, featuring full height custom cabinets in solid hickory with heavy cove moldings and slab granite counters. Backsplashes are crafted in an intricate tile pattern, while floors are porcelain tile for easy cleaning and durability. Appliances include integrated 48” refrigeration, an eight burner Viking gas range with double ovens and a discreet dishwasher. A pot-filler above the range makes cooking a breeze, and a large central island is perfect for casual dining and prep work with its own sink. A spacious casual dining area connects the kitchen with the family room, and provides lots of space for sunny breakfasts, large family gatherings or catered events. It is located in a large bay overlooking the back yard with picture windows on three sides for ample natural light. A French door provides access to the patio and backyard. The family room is of particular note for its scale, level of finish and elegant warmth. Defined by a series of ceiling beams that intersect with paneled columns, and anchored by a massive stone fireplace, this room is the casual center of the house, offering plenty of space for informal gatherings, TV and reading by the fire. A wall of custom built-ins ensures ample room for collections and storage, and a staircase next door leads directly to the large bonus room above the garage. A laundry room with matching cabinetry and top-of-the-line appliances and a well-appointed powder room complete the first floor amenities. The second level of the house is a thoughtfully arranged series of private spaces, optimized for the needs of modern and active family life. It is primarily accessed by a grand hardwood staircase that originates in the foyer and winds its way to a large landing that serves as an entry point to the front and back wings of the second floor. The huge master suite comprises a bedroom, walk-in closet, sitting area and master bath that are set across the entire back of the house for maximum privacy and to capture restful views over the backyard and surrounding nature. The front section of the upper level contains two bedrooms that are connected by a Jack and Jill bath, and a full guest suite across the hall that also leads to the bonus room. The master suite is an opulently scaled private retreat that contains a spacious sleeping area with its own fireplace, a tray ceiling with cove lighting, a balcony and a private seating area that overlook the backyard, as well as a large dressing room with custom built-ins. The master bath is elegantly appointed in slab granite and custom tile, offering two separate vanities, a deep corner soaking tub, private water closet and a two-person walk-in shower with glass block surround. It is flooded with natural light from a corner window and two skylights. Two mirror-image bedrooms overlook the front yard with large bay windows that house built-in desks, and share a spacious Jack and Jill bath with two sink vanity and a private bath and water closet with hickory cabinets and hex tile floor. This is a terrific arrangement for siblings or visitors alike, as it functions as an almost autonomous wing of the upper floor. An additional bedroom and bath are located directly across the hall. Finally, a huge bonus room above the three-car garage offers dramatic vaulted ceilings and tons of natural light at the end of the main upstairs hall. It is accessed through a pair of glass French doors and is wired for surround sound to serve as a perfect media and rec room, but could also be pressed into use as space for multi-generational family members or live-in help. This is a spectacular custom home for those who enjoy tranquility and outdoor space as much as luxurious livability, but who also demand proximity to the region’s many business, entertainment and cultural opportunities. 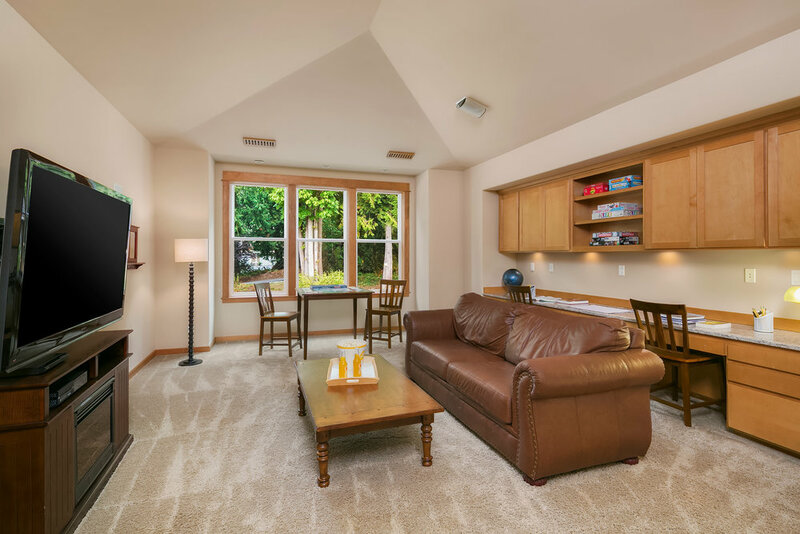 With a stellar location above one of the most popular recreational lakes in the area, and easy access to the I-90 corridor with its connections to Seattle, Bellevue and the Eastside, this home represents an ideal combination of urban amenities and natural beauty.